ITP #25: It's been two weeks! Have you missed your visit Inside the Pomegranate? On this special catch-up podcast, Anush shares the work that's been keeping her busy and the thoughts that are bouncing around inside the pomegranate as she prepares for the New Year. What's going to be your One Little Word for 2014? It's all Inside the Pomegranate! Hey there, did you miss me??? I haven't posted for two weeks, and it feels really good to be back! I missed you. Really I did! I never meant to be away for so long, the days just flew by. I hope you all had a beautiful and meaningful Christmas and that the message of the birth of Love is still being celebrated every day. platefuls of warm cookies to the tables. One family that lives at the shelter was especially grateful for the second plateful....and the third. After we were finished and cleaned up, I asked Edward (the resident manager) if he would take the kids on a tour showing them where the residents slept and what their home at the shelter was like. I think the kids were very moved by it all, and especially noticed the meaning of "family"...that it isn't necessarily the conventional biological family but the people that are gathered together under one roof....sharing life together. The residents have become each other's family. And when we are there together once a month, they become our family as well. Edward shared with me that when our "In His Shoes" name appears as guest chef for the evening on the board, the residents know that the evening will be a good one. He said they are grateful for whatever we serve for dinner, but they know that no matter what is served for dinner when we're there, it is always served with LOVE. He said that they can all feel that. I thought that was really beautiful. And he's right. We do put a lot of love into our efforts, and that is put there by God and our desire to spread His light and love to those around us. Let's see...I also had a blanket to finish up for the blanket drive. And I did finish it. There was a lot of bus crocheting and late night crocheting too. But I'm glad we made it on time. Our church distributed beautiful hand knit/crocheted and sewn blankets to the patients at City of Hope. This an annual blanket project that we've been doing and I love that our church becomes this busy beehive of activity for Christmas. We had our Holiday Jammin' Boutique. I'd like to give a shout out to all of you who came out to hear the amazing gypsy jazz band - Private Cat Radio - and to support our ministry. It was a really fun event. Everyone who came had a great time. Special thanks to Bruce and Connie at the Towns Burr Gallery who opened their gallery to our event. If you would, please show your support by "like"'ing them on their FB page or better yet by visiting their gallery or webpage. They've got some beautiful artwork and gifts. I know there's something I'm forgetting here. I mean other than the Christmas shopping and cooking. Wait....Oh right....so this year our family decided to sponsor a family for Christmas. We all had a great time shopping for the children in the family and trying to fulfill their wish lists. The best part was getting to meet them when we delviered the gifts. Their case worker arranged a meeting. This young family had lost had been evicted from their apartment when the youngest girl was a newborn, only a week old. After 10 years of living in the same apartment, they were short on the rent by $100 and got thrown out. Eventually they were able to get into another apartment only to have a fire destroy everything they owned. Despite the hardships, you would never know their story of you looked at these children in the family. They were all smiles and anticipation for a joyous Christmas. And seeing their beautiful smiles was the best gift of all...for all of us. This reminds me of something I wanted to touch on this week. As you know, I am the coordinator for our In His Shoes Homeless outreach. I like to report on it because I feel that it adds a little bit of an inside look into what this vulnerable population is about. Also, our outreach is supported by donations by kind donors such as yourselves. When reporting about it, whether it's here or on facebook, it's a way for people to hear about our work and support it if they are so inclined. So I wanted to write that any praise that is directed toward the work that we do, goes to God, whose work we are doing. As Christians, it is our duty to love one another...and to care for one another. Before our outreach we always do pray that God allows us to share His love and light with those on the street. And it is only through His guidance and love that this ministry happens. What I'm getting at is that it's not any ONE person. You know? It's all of us, working together, and your prayers and support in action that make it all happen. So thank you to all of you who support us, pray for us, collect clothing, and donate to our ministry. Because you allow us to spread God's love. Thank you from all of us on the homeless outreach crew! And so on to the New Year! 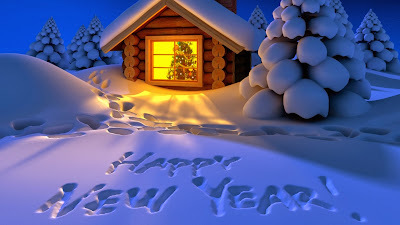 Tomorrow is New Year's Eve! Are you doing anything special to ring in the new year? What about new year's resolutions. Are you making any? Do you have hope that you'll be able to follow through with it? or will they be said and done by the following week? How did you do on this year's resolutions? Hmmm, that's what I thought. Me: "I would like to be healthier by making better choices today and in the New Year. By doing so I would like to see a healthier me". Devil self: "How about warming up a piece of that cream filled khadayif that you made for Christmas...with a nice hot cup of coffee?" Me: "Would eating that khadayif right now help me achieve my "healthier me" goal? What? No? Then I think I'll pass. Bravo!!! Can I hear wild applause for my tremendous willpower??? Do you really think it will happen that way? I hope so, but the reality is that there will be days, and there will be days. Right? The reality is that the one piece of khadayif is sitting there calling me and saying, "come on...I'm here all alone...and if you eat me now...I'll be gone, thus removing the temptation...so go ahead, live a little." Sound familiar? The truth is that we can only do the best that we can do. As long as we are being honest with ourselves that the BEST is truly the best that we can give. Last year, I tried something that I had read on my daughter Ani's blog. She had gotten it from another blogger. It was called "One Little word" and what you were supposed to do - the challenge - was to choose a single word that was going to be your word to work on for the year. So my word last January was "Balance". I was going to try to be more balanced in my life. I don't get very much sleep (which is not good), so one of the things that I was thinking about balancing was my work life, my leisure time, my sleep time, my eating...you get the idea. Balance. Did I have a balanced year, you ask? Well, uh, no. In fact, I think it was sometime in March, just a month or so after "Balance" that I changed my word. And that was because trying to balance made me realize how unbalanced my life was, and it was creating more stress for me and therefore causing more unbalancedness. Does that make sense? The truth is that I don't sleep enough...and I do take on too many tasks. But that's how it has always been with me. I mean, would I be writing this at 12:53 a.m. if I was balanced? Nooooo! So my One Little Word changed in March to....ready? :::drumroll:::: PEACE! Tada!!! And that word worked better for me. I DID have a year filled with peace. And though it wasn't all like that, I did find myself reigning myself in sometimes. Most noticeably, I have changed my attitude about my work that I do for a living. Whereas in the beginning of the year, I was in a constant battle with myself about my job, today, I am realizing that my job affords my healthcare coverage, the ability to keep a roof over our heads and to live a more peace-conscious life. I also experienced a lot of peace in my prayer life this year. 2013 was also my first full year of being a vegetarian (started in November of 2012). And that helped to contribute to my more peaceful year as well. So peace I can do. Balance...not so much. And maybe that's a challenge I'm going to have to take on another time. So, what's it going to be? Only you know the answer to that, but I would love it if you would share. And please do it on the blog on not on Facebook to keep things all in one place! Let me know what your one little word will be. And I will share mine with you, next week. So that about wraps it up this for this week - and this year!!! It's been a wonderful year. I want to wish all of you a very happy and healthy new year filled with an abundance of God's blessings for you and your family. Thank you for all your prayers and support throughout the year. Wishing you all a very pomegranate YEAR AHEAD filled with hope and ripe with possibilities!!! ITP # 24: This week, Inside the Pomegranate, Anush talks about life's Awful moments. Ever have those? We all have, but are we in tune to them? Listen in to hear what Awful moments make it to the top of her list. It's really hard to believe that we're in December now, isn't it? Even more strange is that it seems like just hours ago it was the 1st of the month and already we're in the second week! Christmas is well on it's way, and so is the cold weather here in California. I know, I know, it's not like cold-cold, like what those of you have to experience, but let me tell you, when the temps are in the 50's during the day, and that's COLD for California. But I love it! Everything feels so fresh. And it gives us a chance to wear our scarves and jackets and feel like we have a winter! The calendar is filling up fast. This Thursday we'll be at Glendale's homeless family shelter, cooking our monthly meal. I'm doing something special for this month. I am taking a crew of our younger parish family with me this time to serve and prepare the meal. I have teens and young adults going this time, and one of the nice things is that after we serve the residents we take a plate and join them in the dining room for dinner. This is always such a nice experience, and I'm hoping our kids will really benefit from the experience. Especially in light of Christmas and it's materialism/commercialism. I'm looking forward to it and living the experience through our kids. So on to this week's topic: As a child, and later as a young adult, I had a hard time understanding the term "God-fearing". Back when I was growing up, I sometimes attended campus ministries, and there was that term. God fearing. Or they would say something to the effect of "a good Christian is God-fearing". I had a hard time with this because I was brought up to believe in a loving God. A compassionate Father, who may not always like what we do, but always, always loves us. So the fear concept was strange. Until eventually, I understood that the "fear factor" was more about reverence, and respect for God. And perhaps fear of the unknown? So this past week at our Wednesday night Bible Study, Fr. Vazken was doing a translation of the word "Awful" as it pertains to God both in the English and the Armenian translations. So I looked it up on dictionary.com. Yes, it could mean that...but not when it pertains to God - at least not my God. But reading on with the definition, it gets better. Full of awe; reverential; solemnly impressive; inspiring awe. Now that's more like it! Right? The parallels of the wordplay made me remember those God-fearing days...and made me think of things in my life that were truly AWFUL - or AWEful - where I could really know in my heart that God was showing me his presence and letting me know that He was right there, where He said he'd be, if only I had faith. There have been quite a few awful moments in my life. And when Fr. Vazken asked us if we would like to share ours, my brain started trying to think of those that were truly awful. And I've been trying to think of them every since. So I thought I would share with you some of my most awful moments (and hopefully you'll share yours with me as well). can be all set to be a parent. You can have the crib ready in the baby's room, and all the clothing and diapers ready. You think - I can handle this! I've read the books - and then you're in labor and delivery. 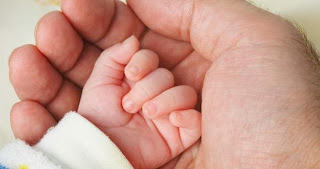 Your body is on auto-pilot and you deliver this little bundle of love. I remember when they handed Ani to me, there was such an amazing presence of love in the room. It was the most profound and AWEful moment. To look at this little miracle of God's handiwork. Perfect little fingers and toes, earlobes, and wide open eyes. We had talked to her for 9 months before she was born; sang and read stories out loud. And I remember when they handed her to her dad, and he spoke to her, she turned her head and looked directly at him as if to say, "Hey, I know who you are! I know your voice." It was such an amazing experience. So this is the first awful moment...and heads the top of the list! I've shared with you one of these moments in another post about our homeless outreach. Our producer, Suzie, and I shared it together. It happened on a homeless outreach to downtown's Skid Row area. We were distributing our soup as we always do when a man asked if he could have a sandwich or a salad. We didn't have that and offered him what we normally bring with us....soup, water, snack. The man thanked us and left without taking anything, and then moments later, a car pulled up. Some people had seen us distributing food and wanted to know where they could take some food they had picked up. Starbucks had just closed and they had taken this food to distribute. We asked what they had. "Sandwiches and salad." I remember Suzie and I just looking at each other, kind of like, "what just happened here???" But as awesome as that was, it wasn't the whole thing. It continued. Because we called the man over to tell him we had food for him. He was so happy to get his food. But rather than take it and eat, he came down on his knees, right there on the sidewalk, held the food up to the heavens and gave thanks to God for hearing his prayer. I will always remember this beautiful, and awful moment. It reminds me to not only have faith, but to believe in the prayers that we offer up to God, because they are being heard. One of my most life-changing awful moments happened one year after my first cancer diagnosis. I had gone for my one year check up. My mammogram revealed another questionable area and I had to go in for another biopsy. The surgeon had told me that yes, it looked like the cancer had returned. He pointed it out to me on the film. I was devastated. I had just gone through cancer the year prior, and now here it was again. We prayed. When I say WE, I mean everyone. My family, friends, prayer groups. The day of the biopsy came. I was draped and anesthetized but I was awake. The surgeon removed the area in question. He said, "Yes, it looks like cancer." He even SHOWED me what he had removed and pointed out the cancer. Off to the lab it went. He called me the next day completely baffled. I'll always remember his words, "Your biopsy came back negative. I don't understand it. I saw it. I showed you. But it wasn't cancer." What was it? He didn't know. Maybe some mutated cells from the radiation...but he hadn't seen anything like that before. Of course I KNEW what it was. This was really the power of God and the answer to prayers. Like I said, this event really changed my life. It helped me to understand the power of prayer, and the presence of God. And because of this, it has helped eliminate the fear. I have nothing to worry about because God will be there to help me through it. All three of these are pretty amazing events that took place. When I think of it, there are many. I shared with you a few weeks ago about my son Nareg, and the divine intervention that brought us together. That was another Aweful moment when we realized that this little boy that we were getting ready to adopt was actually the same little boy that was supposed to be ours 9 years prior. We weren't ready for him then, so God had stepped in to make sure we ended up with him when the time was right. But there are other daily awful moments that I see pretty often. What about the awful sunrises and sunsets? We have to really stop and watch the sky when we notice these moments because the palette of color is changing right before our eyes. It's like watching God painting, adding lights and darks, and swirls of color. It's God showing us the beauty in His creation. And try as I might to recreate that beauty...not just the colors, but the feel of that color transitioning...it just can't happen. Oh wait, I just thought of one more. 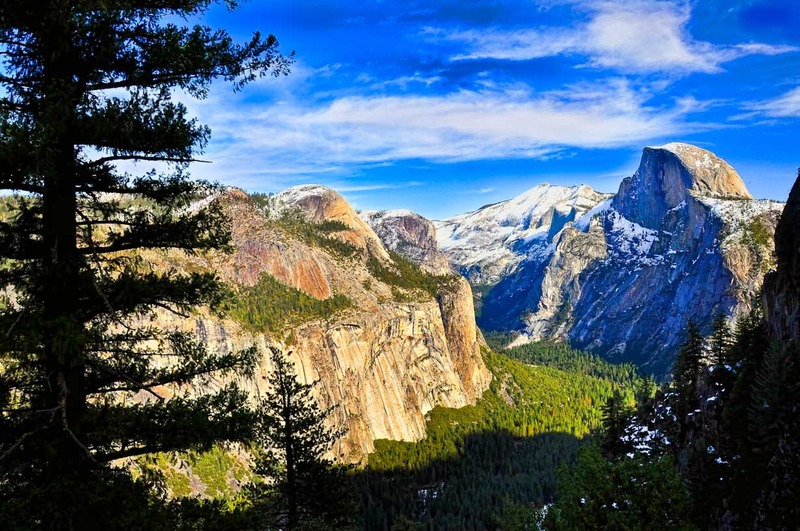 Have you ever gone to Yosemite? As you're driving there, there are a lot of twists and turns in the road where you catch a glimpse of the amazing panorama. And then there's that one final tunnel that goes right through the mountain, and when you emerge you are smack dab in the full view of God's amazing creation. You see Half Dome, El Capitan, the valleys and peaks, the falls. It's a very awful view and you just can't help but pull over, even though you see all the tourists pulled over and taking photos...and you think you don't want to have to be in that space...but you can't not do it because it's mind-blowingly amazing and it makes you feel "so small" because of the wonder and majesty of creation. Okay, so there you have it...those are just a few of my awful moments. I would love to hear of some of yours so please share with me. You know, I write my blog on a weekly basis, but sometimes I wonder who's out there. I read your comments on Facebook, but I would love to see your comments on the blog as they're more permanent. So any comments are really appreciated. Before closing I wanted to let you know about an event we're planning. It's called the Holiday Jammin' Boutique. If you're in the southern California area (of even if you're not and want to come down), we'll be at the wonderful Towns/Burr Gallery in Burbank next Saturday, December 14 from 4 to 9 p.m. 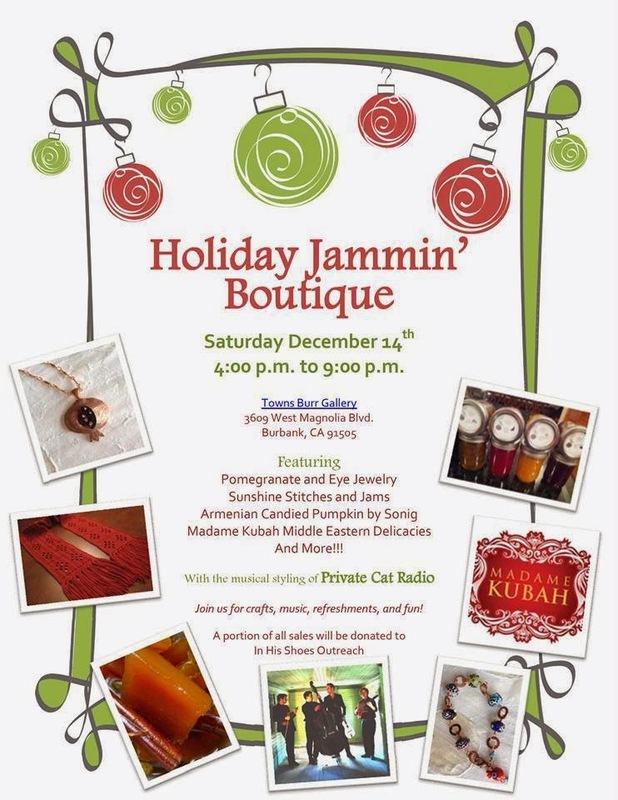 It's an evening event with live gypsy jazz music, and a chance go bring the family out, do a little Christmas shopping. I'll have my Pomegranate & Eye line of jewelry there. Suzie will have her delicious artisan jams and her AWEful knit and crocheted creations. Sonig has made her Armenian pumpkin candy, and Linda will have her Madame Kubah delicacies ready to make your holiday entertaining delicious and easy! AND the best part of it is that a portion of all sales will go toward our In His Shoes ministries. We've got refreshments too. So it's a win/win! Please come out and support us. We would love to see you there!!! ITP # 23: It's December 2. We're back to work after Thanksgiving weekend. But is it business as usual? 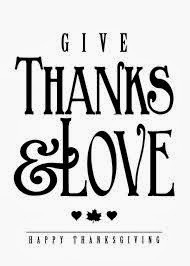 Or are we still riding the wave of thankfulness? Take a look Inside the Pomegranate to learn how love is playing a role in ministering to the needy. It's Monday, and we're back to business as usual after celebrating Thanksgiving this past Thursday, November 28 here in the states. Thanksgiving weekend has always been one I look forward to because our offices are closed the following day after well as Thursday, so we always get a 4-day weekend. I've always loved the non-commercial aspect of Thanksgiving. No gifts to buy. Just a beautiful day to think about all that we're blessed with, spend time with family, and give thanks to God. But this year, for the first time, we heard of stores opening on Thanksgiving day - advertising sales, and urging people to shop on that day. I thought this was really sad. I have a coworker who has 5 children. I asked him what he was doing on Thanksgiving. "Nothing," he said, "my wife has to work." His wife works at Macy's department store. Without mom at home, the whole family would have to forego having Thanksgiving dinner together. "It's not the same without her there." I fear that in the future, this beautiful tradition/holiday of giving thanks will take a back seat to commercialism. That's just sad. And really the only way that we can combat this is to not fall for it. Black Friday started at midnight the following day. That should be enough, right? Now don't get me wrong. I love a good sale. In fact, my sister Sona and I have our own tradition. We do a 5:00 a.m. Friday morning run to Macy's and Target. This year, there was no one there. When we were coming home from Thanksgiving dinner at my daugther's, it was close to 10 p.m. as we passed the mall. The parking lot was PACKED with cars. This is on Thanksgiving evening. 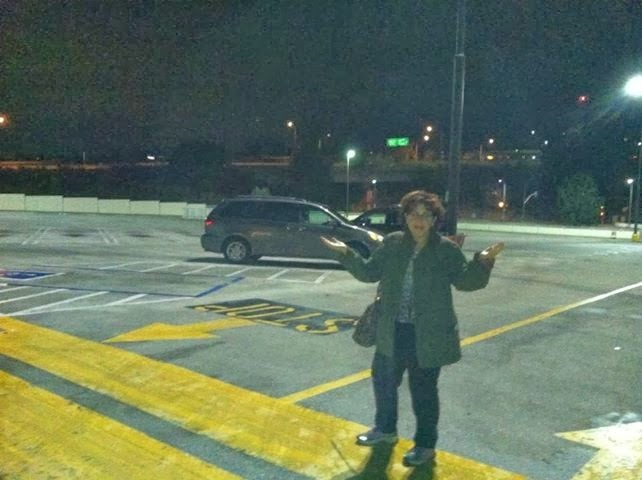 My sister and I were at the same mall at 5:00 a.m. the following morning and there were very few cars in the parking lot. What I'm saying is, why ruin your thanksgiving with lines, and crowds, and miss spending quality time with your family when you can get the same deal in the following morning without all the hassle? Doesn't make sense; does it? You can shop anytime. And actually, isn't the precious little time that we have with our children and family worth it? I don't know...that's just my thinking. What are your thoughts about shopping on Thanksgiving day and department stores that are open touting Thanksgiving Day sales. I mean, I know there are business that are open that day, namely, grocery stores for last minute items. Hospitals, of course....but these are necessity stores. I'm talking about the retail stores. Tell me what you think (leave a comment!). I wanted to write about Love and Thanks. Specifically as it ties in to our homeless outreach. When we help the needy, it's not out of false thanks, like the Pharisee in the parable, who thanked God that he was not like the lowly tax collector. It is out of love. And because as Christians, we are commanded to do so by our God, Jesus Christ. This week we had an opportunity to extend a hand up twice in one week. On Monday night, our In His Shoes homeless outreach took to the streets of Skid Row in a very special evening. Friends of our In His Shoes family, Sonig and Kevork had donated the evening's meal in memory of their nephew, Harout, who was taken from us tragically at a young age. They had provided sandwiches, and our usual fare of soup, snacks and water bottles. But in addition they had donated these beautiful green apples. (I seriously felt like the witch in snow white, offering pretty apples to my friends on the street.) So we had plenty of food. We had also collected a record amount of clothing this time around. We went on our outreach with 4 cars (where we usually take 3). And we had a LOT of clothing to distribute. In fact, we had so much that I thought we wouldn't be able to distribute all of it and as we usually do, we'd drop the remaining clothing at the rescue mission. But there were many on the streets and the people were so grateful as the weather has taken a turn for the cold. As happy and grateful as they are though, it's also difficult. Tempers do flare up. And sometimes we do witness anger and frustration. As you can imagine, when we do our outreach, we all have something to do. Whether it's distributing soup, passing out water bottles or trying to find the right size of clothing for the right person, we're all doing something. And what I do is to help wherever needed, but mostly to be the lookout to make sure things are running smoothly, and to give the call to pack it up if there's anything that might put our group in danger. As the food was being distributed, I heard voices being raised. I didn't see the soup fly, but I heard about that after the fact. But I did hear one man raising his voice to another, and tensions started rising. I called out to our team..."Pack it up! We have to go!" As much as we love being there to help our brothers and sisters, we do need to be safe. So I had made the call. Until Dolly came up and asked if we would please stay. If you follow my blog or podcasts, you may remember me mentioning Dolly Dotty Dorothy. She is a small woman from Ghana and she is a missionary. She is on the street by choice. A vision on the streets of Skid Row, she wears all white. She very rarely asks for anything for herself, but knows who needs what. When the fight broke out, and I was ready to pack it up, it was Dolly who asked us to stay. "Please don't go. I will make him stop." The man who was causing the problems was a large man, and Dolly was small comparitively. But she went right up to him and said, "All these people will not get to eat or get the help they need because of your anger. You must stop." I don't know if it was Dolly's vibe. Or the man's realization of the situation, but I heard him say, "I'm not fighting. I didn't do anything." And he just walked away. Watching this, I really appreciated how Dolly had approached this man. He was combative, and later, I learned that he had thrown soup at one of the people that was waiting for food. She didn't yell. She didn't meet violence and anger with the same...but she approached him with love. She was firm, but her reasoning for this man to stop the way he was acting was out of love and concern for the others. Approach all things with love. A great lesson witnessed in action. I noticed a lot more young people on the street this month. One young woman sat expressionless on a blanket on the sidewalk, staring straight ahead while her friend sat beside her trying to engage her in conversation. My crew appoached her with clothing, with food, she didn't want it. You could tell there was just emptiness there. She remained still and unmoving the whole time we were there. We didn't know if she was on drugs - numb to everything. Or if she was angry. But this young woman was very real, there on the street sharing a blanket with a man over two times her age. And it makes you wonder what happened that caused such a disconnect. We met a young man in his 20's named Ryan. Yeretzgin. Susan and Hourig had been working with him to find him clothing and shoes that would fit. This man was so grateful for whatever they had provided him. He had only the clothing on his back. He was newly homeless. His problem - meth addiction. He had come to California with his girlfriend. But the drugs took over his life. Soon he was unable to pay the rent because of his habit, and he told us that although he and his girlfriend loved each other, she told him that he brought too much darkness into their relationship. They got evicted, she left him, and there he was on the street. I was surprised by how likeable and articulate he was. And he was very much aware of his shortcomings. He was in a recovery program and said he was not using. Checking in with his probation officer, he was subjected to daily drug testing and was clean. It was terribly sad. There he was trying to fix his life, yet he was right in the center - the worst possible place to be as a recovering addict - right where all the drugs are. You wonder, where are the parents? He mentioned to Susan that his father had come to visit him and stayed in a hotel as Ryan was on the street. What would cause a father to abandon his son? But in all fairness, we don't know what the situation is. I've learned that drugs can cause people to do very strange things....lying is one of them. So who knows what the situation was that caused him to want to numb himself in the first place. So we talked to him. Tried to encourage him I gave him a the names of a few agencies that might be able to help him with temporary housing and programs to help him out of his current situation. As we left him, he was so thankful. We told him we would pray for him. We were trying to encourage him and told him to fight for what he wanted. "Love conquers all!" we told him. "I believe that," he said. As we hugged him goodbye, he said that he hoped to see us again. Susan told him that as much as we would love to see him again, we hoped that he next time we came around that he would be in a better place off the street. Then he said that maybe someday he would join us by doing what we're doing - helping others on the street. We left that spot feeling a lot heavier in the heart. As a mother, I hurt for him and I couldn't get him out of my heart. And it made me realize that Ryan could be any of our own children, taking a wrong path that lead him down a difficult spiral. Our prayers continue with Ryan, and I've asked many to pray for him. I ask that you please remember Ryan in your prayers. He will need God's strength and united in prayer, we can help him. That was our Skid Row outreach. 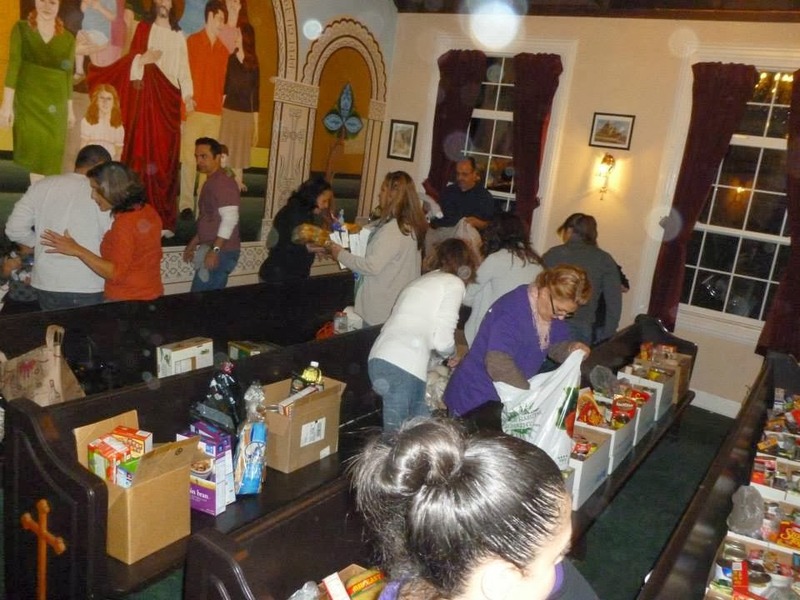 On Thanksgiving Eve, we had our annual canned food distribution. Fr. Vazken had asked us to be at church by 6:00 p.m. to sort through and box all the canned and dried food that we had collected. When I got to church that night at 6:15, the church was buzzing. It was like a beehive of activity. Seriously. Boxes were lined up on the pews in several rows. 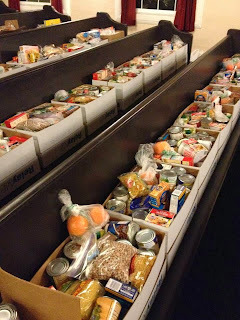 There were piles of canned and dried food sorted out, and basically, you picked up the food and put one or two of each type into the boxes. This way each box had a variety of foods. Rice, tomatoe sauce, beans, fresh and canned fruit, peanut butter, meat, you get the idea. So anyway, everyone was sorting or boxing and before you knew it, we had all these boxes ready for delivery. families had come to our prayer service and it was nice to share this beautiful service with them. And I hope that they understood that our offering to them was made out of love. I had coordinated with Ascencia - Glendale's homeless shelter - and asked if they had some transitional families that might need our help. We were able to help four families there that were in housing, working, but barely able to make ends meet. The families were contacted and told to pick up directly from the shelter. It was after 8:00 p.m. by the time I drove there. Peeking in the glass door to the dining room, the room was dark with only the kitchen light shining. I pushed the button to ring the bell. In the kitchen, I could see the woman I had met last month, cleaning the kitchen. A little boy came to the door and opened it. He had to be around 5 or so. Sarah, one of Ascencia staff, came to help me with the boxes, and together we carried them in. She was so touched. When I had told her over the phone that we had food to bring over, she said she never thought it would be so thoughtfully put together with a variety of foods for a family. She thanked us and said what we had donated would help so many for a few weeks. She got all misty eyed when she wished me a happy Thanksgiving. We said our goodbyes, knowing that we'd be seeing each other on the 12th when we'll be preparing the meal there on our monthly outreach. As I drove home, it was close to 9:00 p.m. Later than I thought I'd be. Ned sent me a text, "Are you okay?" I was better than okay. The question made me think about what I was feeling. Content - Because I live a full life. It may be busy and chaotic, but I don't think I'd have it any other way. Thankful - Thankful for all the usual things. My health, job, family. And that I am part of an amazing church family that joyfully (and actively) follows the teachings of Christ in helping others through acts of Love. Today, on this December 2nd, I want to wish you all a very happy Thanksgiving. Because just as everyday is Christmas for the Christian, and every day is Easter for us too as we take the message of victory forward in our lives, every day for us, is (or should be) a day of Thankgiving. Happy Thanksgiving!